Elephants continue to roam across much of Africa, but these magnificent animals remain under severe threat from poaching, habitat loss, and human-wildlife conflict. 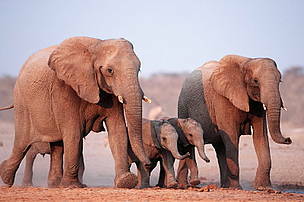 African elephants are the world's largest land animals. The biggest can be up to 7.5m long, 3.3m high at the shoulder, and 6 tonnes in weight. The trunk is an extension of the upper lip and nose and is used for communication and handling objects, including food. African elephants have two opposing extensions at the end of their trunks, in contrast to the Asian elephant, which only has one. Tusks, which are large modified incisors that grow throughout an elephant's lifetime, occur in both males and females and are used in fights and for marking, feeding, and digging. The other notable feature of African elephants is their very large ears, which allow them to radiate excess heat. 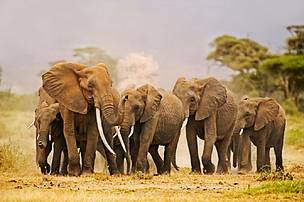 There are two subspecies – the larger savannah elephant (Loxodonta africana africana), which roams grassy plains and woodlands, and the smaller forest elephant (Loxodonta africana cyclotis), which lives in the equatorial forests of central and western Africa. Savannah elephants are larger than forest elephants, and their tusks curve outwards. In addition to being smaller, forest elephants are darker and their tusks are straighter and downward pointing. The complex social structure of elephants is organized around a system of herds composed of related females and their calves. Males usually live alone but sometimes form small groups with other males. In the savannah subspecies, each family unit usually contains about 10 individuals, although several family units may join together to form a 'clan' consisting of up to 70 members led by a female. Forest elephants live in smaller family units. Usually, a single calf is born after a gestation period of 22 months. Young elephants wean after 6 to 18 months, although they may continue nursing for over 6 years. Male elephants leave their natal group at puberty and tend to form much more fluid alliances with other males. Elephants live up to around 70 years, with females mostly fertile between 25 and 45. Males need to reach 20 years of age in order to successfully compete for mating. African elephants mainly eat leaves and branches of bushes and trees, but also eat grasses, fruit, and bark. African elephants once roamed across most of the continent from the northern Mediterranean coast to the southern tip. But they are now confined to a much smaller range. Savannah elephants occur in eastern and southern Africa, with the highest densities found in Botswana, Tanzania, Zimbabwe, Kenya, Zambia and South Africa. The forest elephant is found in the equatorial rainforest zone of west and central Africa, where relatively large blocks of dense forest still remain. Back in the early part of the 20th century, there may have been as many as 3-5 million African elephants. But there are now around 415,000. 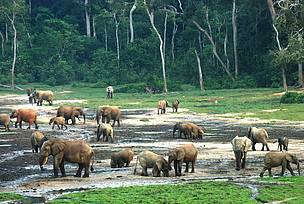 Most countries in West Africa count their forest elephants in tens or hundreds, with animals scattered in small blocks of isolated forest. 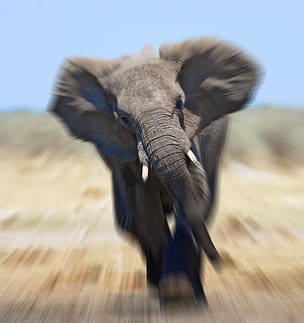 In contrast, savannah elephant populations in parts of southern Africa are large and expanding, with almost 300,000 elephants now roaming across the sub-region. 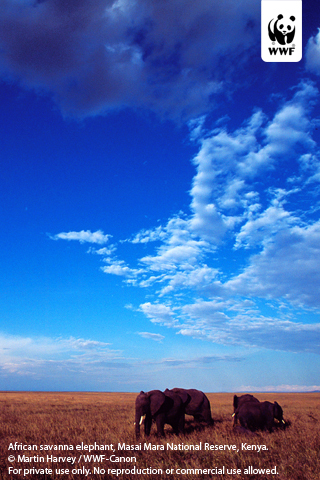 Significant elephant populations are now confined to well-protected areas. 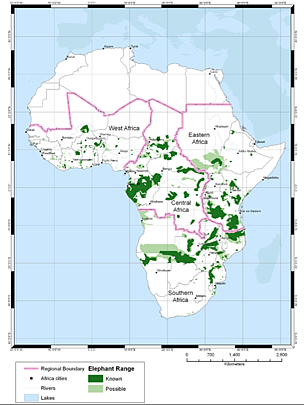 However, less than 20% of African elephant habitat is under formal protection. Despite a ban on the international trade in ivory, African elephants are still being poached in large numbers. Their ivory tusks are the most sought after, but their meat and skin are also traded. Tens of thousands of elephants are killed every year for their tusks. 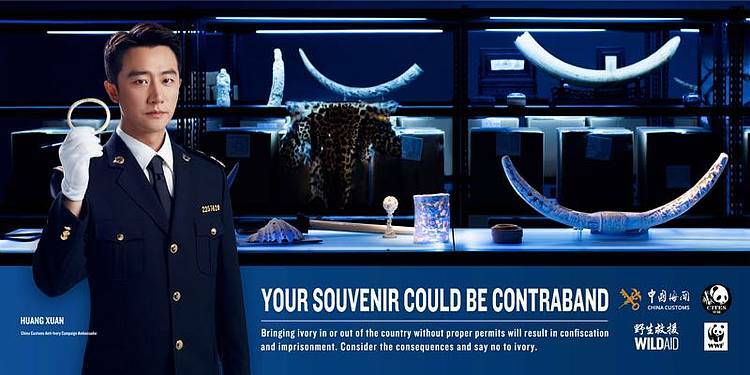 The ivory is often carved into ornaments and jewellery – China is the biggest consumer market for such products. 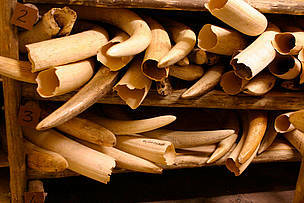 The ban in international trade was introduced in 1989 by CITES (Convention on International Trade in Endangered Species of Wild Fauna and Flora) and it allowed some populations to recover, especially where elephants were adequately protected. But there has been an upsurge in poaching in recent years, which has led to steep declines in forest elephant numbers and some savannah elephant populations. Thriving but unmonitored domestic ivory markets continue in a number of states, some of which have few elephants of their own remaining. 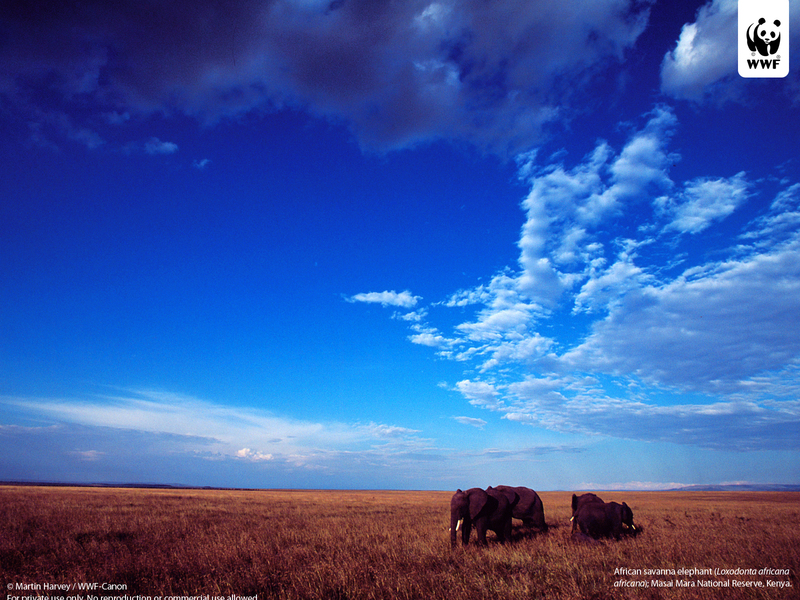 Insufficient anti-poaching capacity, weak law enforcement and corruption compound the problem in some countries. Meanwhile, as the human population expands, more land is being converted to agriculture. So elephant habitat is shrinking and becoming more fragmented. This means elephants and people come into contact more often, and conflicts occur. Elephants sometimes raid farmers’ fields and damage their crops – affecting the farmers’ livelihoods – and may even kill people. Elephants are sometimes killed in retaliation. With human populations continuing to grow across their range, habitat loss and degradation will remain major threats to elephants' survival. Angola, Benin, Botswana, Burkina Faso, Cameroon, Central African Republic, Chad, Congo, Democratic Republic of Congo, Côte d'Ivoire, Equatorial Guinea, Eritrea, Ethiopia, Gabon, Ghana, Guinea, Kenya, Liberia, Malawi, Mali, Mauritania, Mozambique, Namibia, Niger, Nigeria, Rwanda, Senegal, Sierra Leone, Somalia, South Africa, Sudan, Tanzania, Togo, Uganda, Zambia, Zimbabwe. Enhancing the capacity of wildlife authorities to conserve and manage elephants. 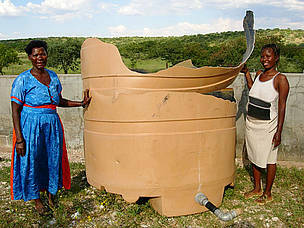 Buy a gift of chilies, dung and engine oil and help reduce conflict between human and elephant populations. 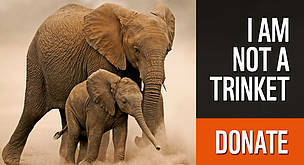 Donate to WWF to help support our African Elephant Programme. And see how your donation helps. African elephants care for wounded individuals and are unique in that they identify and look after elephant bones. African elephants are the world's largest terrestrial animals.